So, we made it into Colombia! If you’re crossing the border to/from Ecuador anytime soon, definitely have a read of my step-by-step guide, ‘cos it was confusing as hell! But anyway, we made it. The town of Ipiales doesn’t have a huge amount to offer, and it felt a little sketchy when we went out to find dinner (it didn’t help that EVERYWHERE was closed as it was a Sunday night and a holiday weekend). However, it’s still definitely worth the visit, if only for a pitstop to Las Lajas Sanctuary, an incredible church about 15 minutes away by taxi (COP$10000/USD$3.50). The church is built right into the mountains and forms a bridge across the river… it’s a pretty incredible sight. Our next stop was Cali, which involved a 12 hour overnight bus journey. The journey wasn’t actually too bad – the buses here are pretty comfortable and I’m finding that I’m able to sleep most of the time, albeit waking up every hour or so. Arriving early in the AM is always a little confusing and thankfully our hostel, the awesome Pelican Larry, let us check in right away so we all got some much needed rest. We didn’t do a whole lot in Cali to be honest – we explored the surrounding areas, ate good food, chatted to some other travellers, and actually cooked our own dinner for the first time since arriving in South America – the cheap food just makes it too easy to go out all the time! We were also joined by two more of our Kamala gang from Montañita, bringing our group back up to six – I love that we keep popping in and out of each others’ travelling stories. I actually spent most of our stay in Cali editing my Ecuador video, and I’m pretty pleased with it! I’ll be making videos for every country we visit, so keep your eyes peeled. After Cali we hopped on yet another bus, this time it was just a 4 hour bus journey to Salento – you first get a 3 hour bus to Armenia, then switch to a local bus for about an hour up the mountain. As soon as we arrived, I immediately knew Salento was going to be somewhere I liked. From the brightly coloured houses, to the incredible views, it’s a town that has a certain special charm to it, and I wish I could have stayed longer. By the time we arrived on our first day, it was basically the evening, so we really just went out and got some dinner, then our heads hit the pillow – we were getting up early the next morning to go see some very tall palm trees, the tallest in the world in fact. 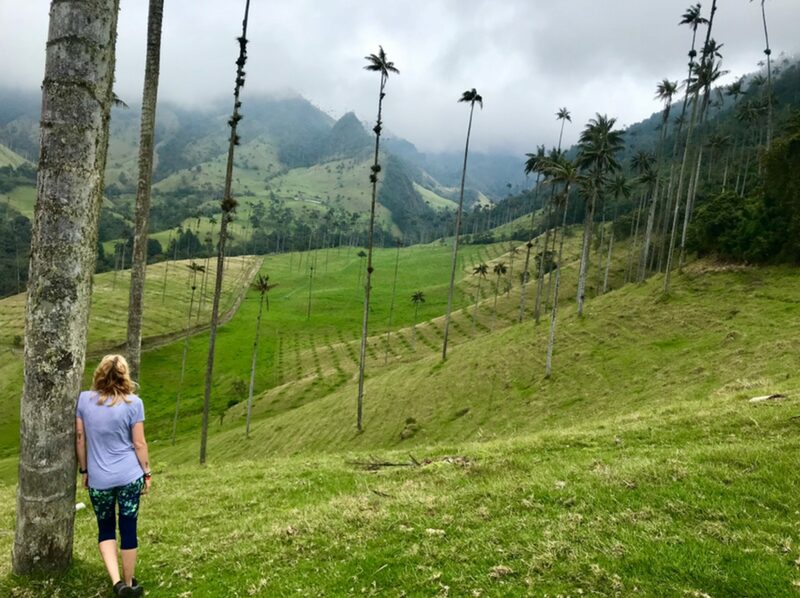 Cocora Valley did not disappoint. The trip started with a ride up the mountain in a very cool Jeep (and we all know Jeeps are my dream car) – the boys even got to ride on the back! 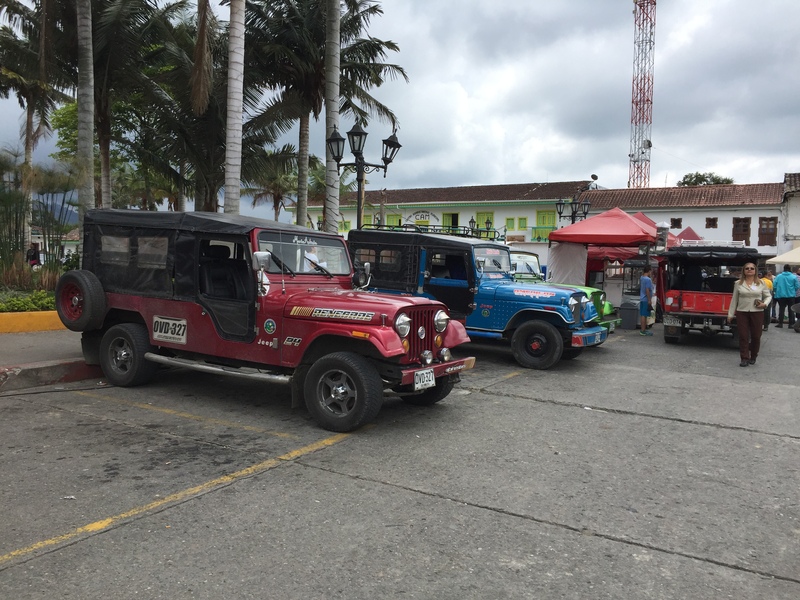 You find the jeeps right in the centre of town and get your return ticket at the little shed right next to the line of colourful cars. It costs just COP$8000/USD$2.50 and the jeeps run from 7:30am-6:30pm. I’d definitely recommend getting an early ride up to Cocora, as the clouds come in fairly quickly, ruining all the views. Our palm tree hunt didn’t quite go to plan though, as we somehow missed the entrance to climb the hill for the view of the trees and walked straight past it, setting us on a path for a 10km+ round trip… UPHILL. How we managed to walk past the very obvious hut and sign that explicitly said ‘mirador‘ (view point), I don’t know… we must have been deep in conversation or something, but we all felt a little silly when we realised our mistake. Our accidental hike was, while absolutely exhausting and a killer on the lungs due to the altitude (ok fine, it doesn’t help that I haven’t worked out in about 15 years), actually pretty fun. Hmm… maybe fun isn’t quite the right word. Let’s just call it memorable. Memorable and muddy. Anyway, we found what we were looking for in the end and used up our last little bit of energy to haul ourselves to the top of the hill for some views that really didn’t disappoint. The palm trees are truly enormous, stretching high up into the sky, seemingly forever. 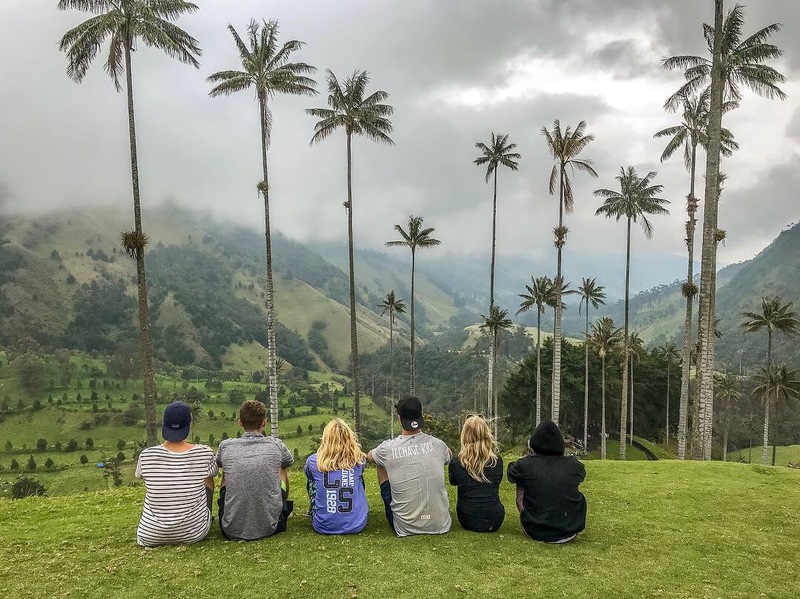 The Cocora Valley is part of Los Nevados National Natural Park and sits (at its lowest) at roughly 5,900 feet above sea level and it’s here that the Quindío wax palm (Ceroxylon quindiuense) thrives, growing up to 200 feet tall! It’s something you can’t really appreciate properly until you see it in person. From Salento we took yet another bus (the buses really are the easiest way to travel here), our most luxurious and roomy bus yet, to Medellín. This was again, quite a long long journey, and it took us about 10 hours in total. 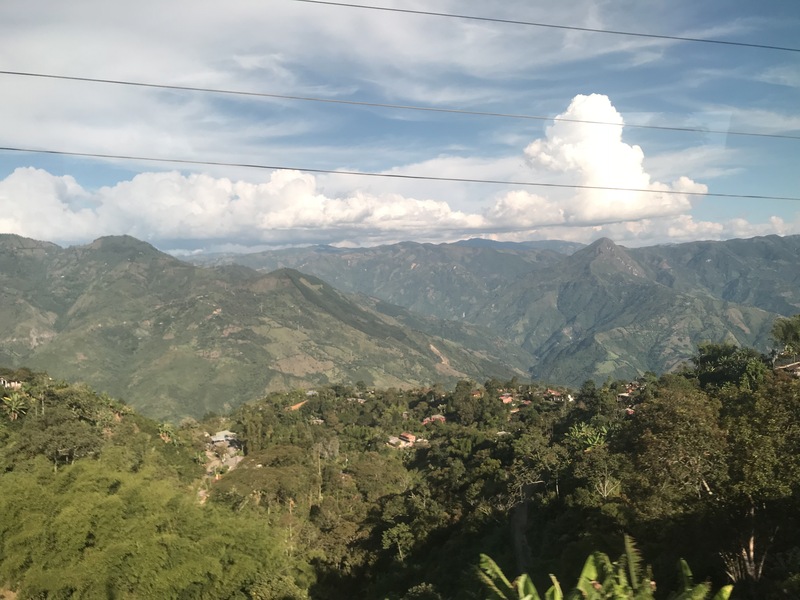 Taking a bus during the day sometimes feels like a waste, however this journey was truly something special, particularly during the last few hours, when were were treated to vast views of the mountains, the likes of which I don’t think I’ve seen before. 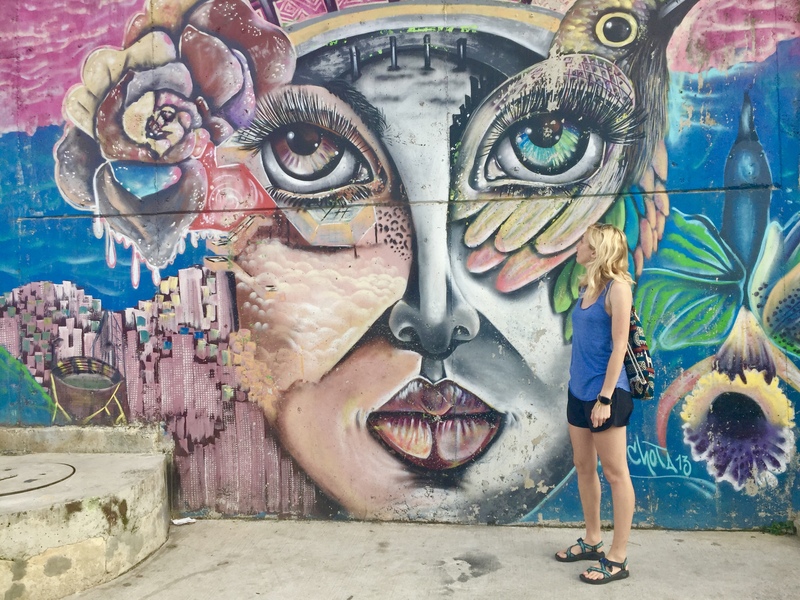 I didn’t really know what to expect from Medellín, other than that I’d heard there was some cool graffiti and it’s a good place to party. The partying side doesn’t really interest me too much (I must be getting old) so I set my sights on taking in as much of the culture of the city as possible. 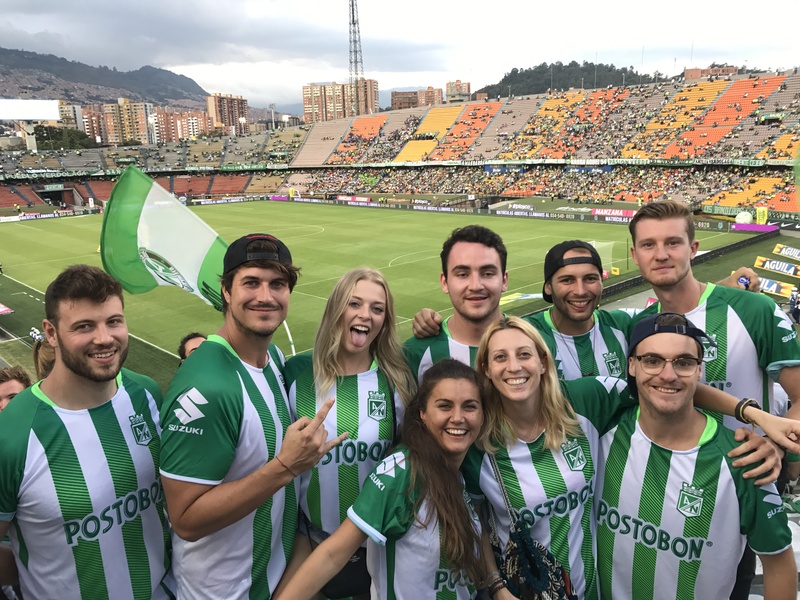 Our first outing was to a football game – Atlético Nacional vs. Cali – and it was definitely an experience, that’s for sure. I’ve spent the last 20 years going to football in London, but that didn’t quite prepare me for the sheer volume and excitement that filled the stadium here… there was a full band who played for the entirety of the match, everyone stood the whole time and the singing just didn’t stop. I don’t think people were really paying much attention to the game itself (not much lost there… the football was really pretty awful), they were just having too much of a good time singing, shouting and jumping up and down. Our last day in Medellín (before we head to the Caribbean coast this afternoon) was spent exploring Comuna 13, a neighbourhood that has only recently begun to be transformed from what was once one of the most dangerous areas, into a vibrant and colourful community, with some incredible street art and even more amazing views over the city. As it was a public holiday, there weren’t really many guided tours going on, but it was amazing to just walk around and see how this area has been revolutionised through improved accessibility, investment and community spirit. I loved the contrast of the modernised escalators that travelled up through the town against the run-down brick buildings… new meets old, in an amazing way. Comuno 13… I absolutely loved the street art! Now we’re off to catch our (very short) flight to Santa Marta, up on the Caribbean coast. I can’t wait for some more sun, sea and sand. I love exploring the cities, but we all know that the beach is where my heart is.